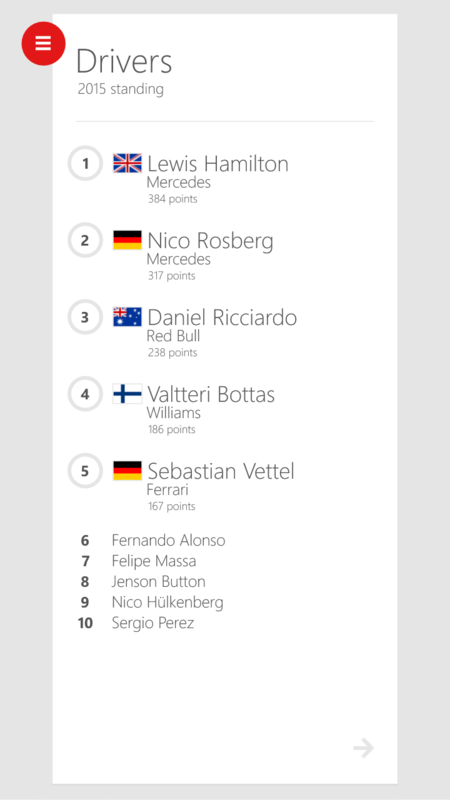 If you a F1 fan looking for an app to keep you up-to-date throughout the 2015 season, look no further than ESPNF1. 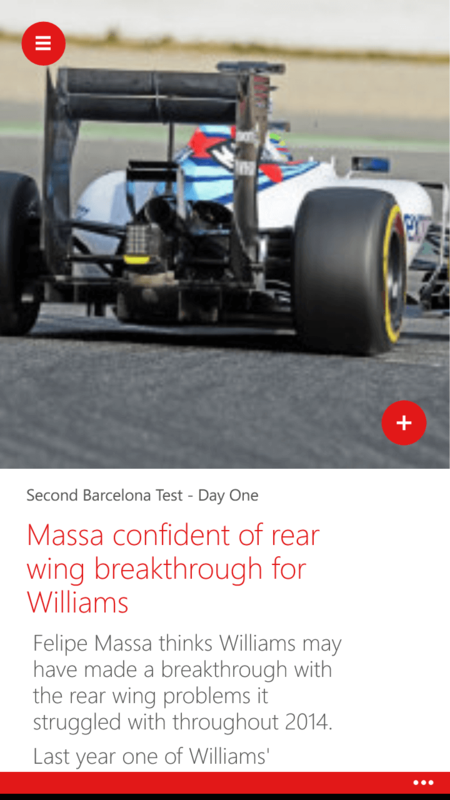 This app has news, features (including video features) as well as in depth information about the drivers and teams. An easy to use and well design app, ESPNF1 will help you stay, erm, up-to-speed throughout the season. anyone who uses Windows Phone with side swipes to navigate to the different areas of the app. You can also use the Hamburger menu in the top left of the app to navigate to those same areas which include Calendar, News, Features and Standings. The navigation in the app is smooth with large thumbnails to take you to news articles or video features. It is easy to navigate this app with one hand. The Calendar section of ESPNF1 brings you the calendar for the upcoming 2015 season which starts in Australia on the weekend of March 13-15. Like other parts of the app, you can navigate to each race circuit by swiping left or right on the screen and tap on the thumbnail of the circuit you are interested in viewing for more details. 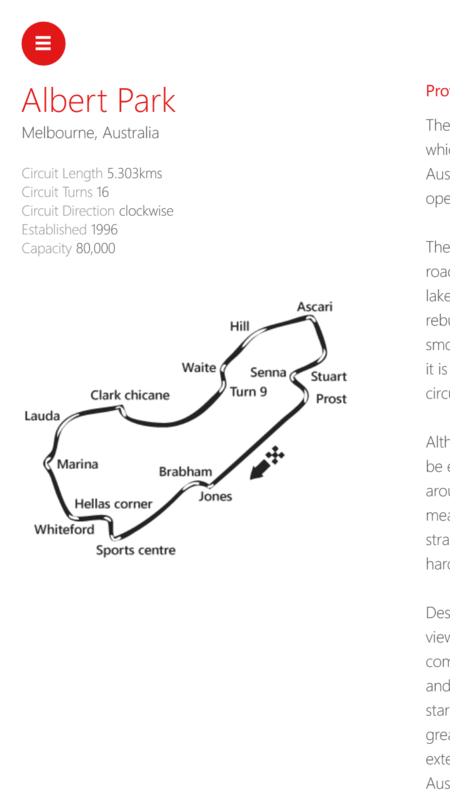 Those details include a track map and a small write up on the history of the race and circuit. 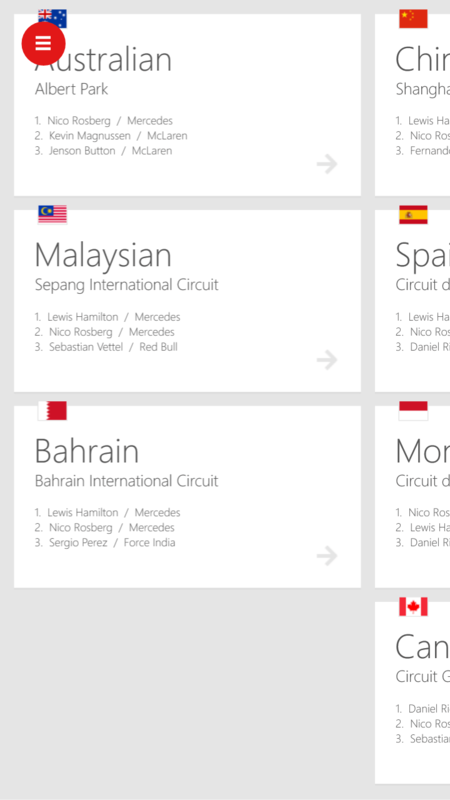 You will also see the 2014 results of the race at that circuit given that the 2015 event has not happened yet. The one area of improvement that could be made in the ESPNF1 app is here in the calendar section. It would be great if the app showed you the start times of the Practice sessions, Qualifying and the Race in your local time zone. Unfortunately it doesn’t. If this were added to the app in a future update it would truly make it the one-stop app for F1 fans. section is the Features section of the app. Features are more in depth articles or video articles about a personality, team or other aspect of the sport. The videos are streamed from ESPN so you will need to make sure you are online to view them. In my testing for this review, I had no problems streaming videos using HSDPA+ on my Lumia 1320, LTE on my Lumia 635 or Wi-Fi on either. 2014 results. Likewise, if you tap on the Constructor standings you can go to the detail pages for each team which includes a history of the team, their current driver, seasons in F1 and race stats. As I indicated in my opening comments, the ESPNF1 app is one of the best and most complete apps for F1 fans on Windows Phone. It is loaded with news and features to bring you up-to-date and closer to the sport overall but also to the individual driver and team levels. 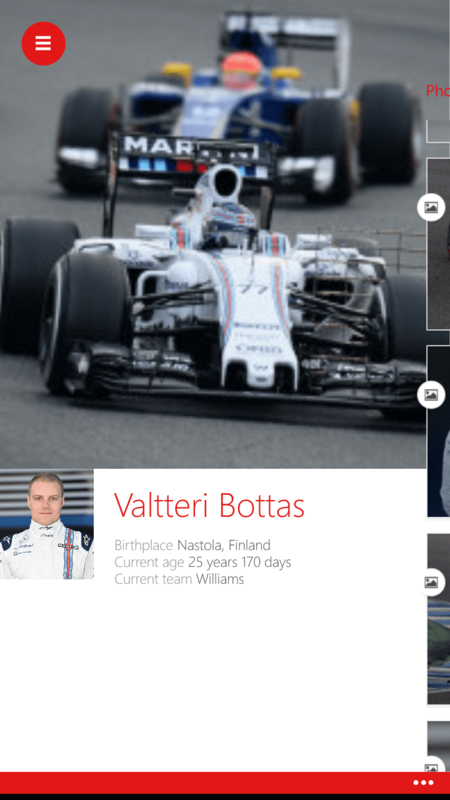 Even if you are new to Formula One, this is a great app to start with as you can dive into each of the driver and team pages to get their history and place within the sport. From a performance and feature richness perspective, the app is great. I had not problem with the app on either of my phones with navigation being smooth and responsive. I would like to see the times of the races in the calendar area of the app and hope to see that in a future update of the app. Speaking of updates, I suspect that this will be updated soon. The last update ESPNF1 saw was just before the 2014 F1 season so it is due. 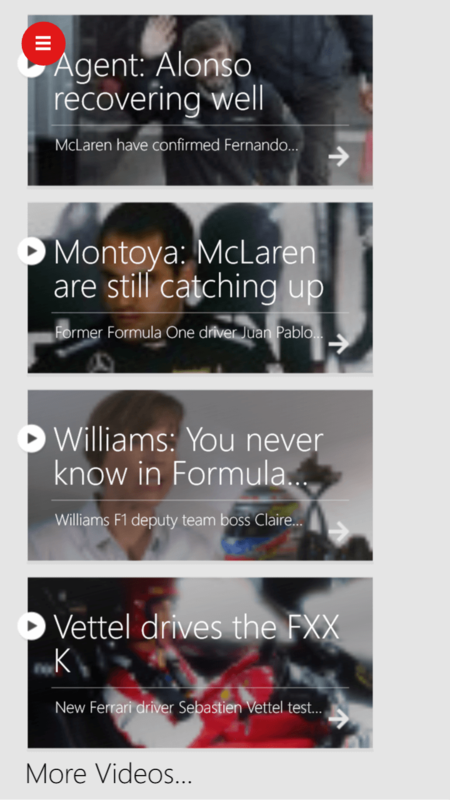 ESPNF1 is a free app for your Windows Phone.